My husband and I are big kids at heart. We still play from time to time, we still play video games, and we still watch cartoons. The cartoons are mostly movies, but hey, don’t judge me. Everyone knows that there has always been a theme for girls. The lead is a pretty princess, she gets into some trouble, somehow a love interest gets involved, they fall in love, and everyone lives happily ever after. That’s great. A nice traditional story that leaves everyone feeling good. Last night, Tony and I watched Moana. Now, there may be some spoilers below. If there is any chance, you may get mad at me for ruining it for you, even by accident, you may want to stop reading. I intend to tell you everything I liked about this movie even if it means giving things away. So, let’s get started. Moana lives in a gender progressive tribe. When we first meet Moana, she is a child being steadily groomed by her father to be become leader of her people. I felt very good about this. In traditional Disney, there is usually a king or a prince or another strong male to rule the land. For a girl who was raised with this and being from a country that has never had a female president, I feel this is so important for our little girls. Also, when Moana is jokingly called a princess, she strongly says that she is the daughter of a chief and will one day be chief of her people. She is a strong female lead of color. Disney and other children movie makers have gotten better at including people of color. Maybe not to the extent I would like, but progress, my friends, progress. Pocahontas was a good one, so was Jasmine and Mulan, and of course, Tiana. 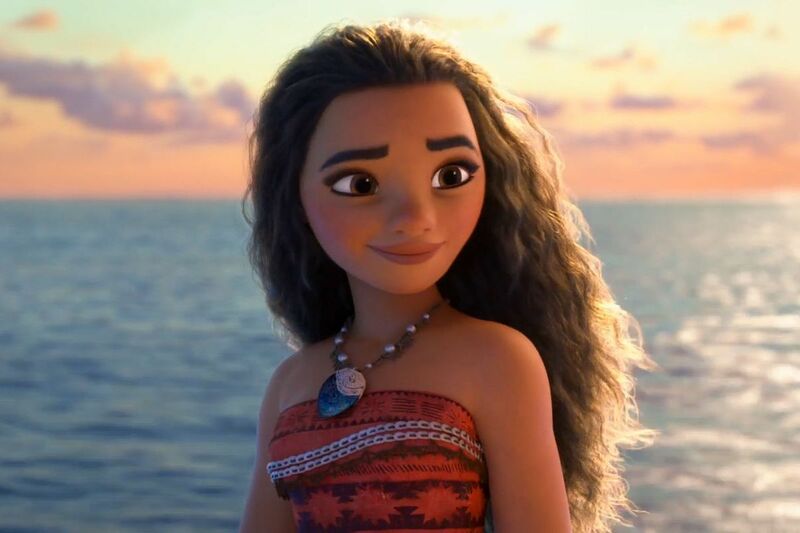 I’m very proud that Moana is a strong Polynesian girl. All little girls should have someone to recognize with. Pacific islanders are well represented with Moana. She is determined and pushes limits. Where Jasmine was confined to the palace, Moana is not to pass the reef around her island. Her father has made it law. While her heart tells her that they should venture out to save her people from ecological destruction, her father will not be moved. Moana’s determination, strong will, and desire to push the limits are what takes care of business throughout the movie. This is important to instill in the next generations of our daughters. Sometimes what’s traditional may not always be right, especially when lives are at stake. I mean, remember human sacrifices? From the time she is a toddler, she doesn’t have much fear. Even when things get tough and it’s obvious that she’s in a scary situation, she musters up courage and faces whatever comes at her. Sometimes as ladies, we are taught to be meek and mild and seek help for things. While this is important at times, we must also be able to face things on our own. Like Moana, we may be the only one standing for what’s right and for what we believe. Moana faces down bad guys, a demigod, and even her own father. She actually saves someone else. It’s a known pattern that the princess gets saved, the bad guys are vanquished, and good wins out in the end. That makes great stories. However, rarely do we see where a female lead saves other people much less herself. As I mentioned, Moana faces bad guys. Sometimes when other people are retreating, she rouses the courage within herself and saves the day. Maui, the demigod who is suppose to be a hero, often retreats and Moana stands to fight. Let’s all take a moment to appreciate this. While there is love between Moana’s parents, there’s no love interest, no broken heart, and no romantic fate. None. I can’t tell you how refreshing this was for me. She doesn’t fall in love. She doesn’t have a crush. She is just a teenage girl who is determined to save her people and become a great leader one day. She shows depth and compassion. While the seemingly bad guy being misjudged is not a new concept, Moana takes it to a new level. Because she shows compassion and uses her head, she realizes that not all perceived bad things are really bad. Sometimes if someone has been treated unfairly, they react in a negative way, and sometimes a little compassion and care can change how someone sees and reacts to the world. Moana has goals in life. When things don’t go as planned and things get tough, she listens to her heart, uses her head, goes on a grand adventure, goes up against challenges, and saves the day. Our little girls may not face the same type of monsters Moana did, but we have plenty of monsters in our society that they will face. They should be equipped with the knowledge that girls can save the day, too.